Isaac Graber, an 8th grader in the Academy, put on another impressive athletic display by placing amongst the top finishers in the 32nd annual St. Louis JCC Labor Day Triathalon. 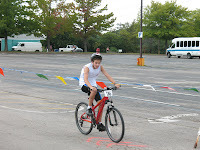 The competition consisted of a 200 meter swim, a six mile bike ride, and a one mile run. Out of 200 young Jewish athletes in the race, Isaac finished 2nd in his age bracket and 6th overall. Way to go!